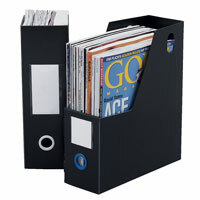 WoodWork Magazine Files are made from beautiful wood veneer and have polished-steel pulls and label holders. Coordinate with other WoodWorx accessories for all of your storage needs. Available in four finishes: mahogany, oak, cherry or black. 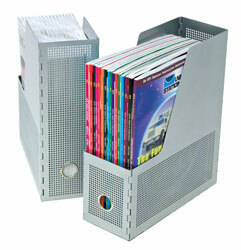 SteelWork Magazine Files have finger rings on both sides to allow easy access from shelves or cabinets. The perforated pattern and lustrous powder-coated silver finish provides protection as well as an elegant look for the modern office. Fabric pads on the bottom protect furniture from scratches. Coordinate with other SteelWorx accessories for all of your storage needs. PortaFile Magazine Files are made from 1.4 mm thick polypropylene with color-coded finger rings to makes visual identification of contents even easier. Finger rings and labels are on both sides. 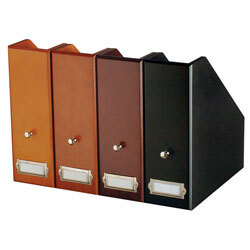 Coordinate with other PortaFile accessories for all of your storage needs.